Riddick continues the adventures of Vin Diesel’s stoic character as he survives yet more attempts on his life using tactics and a very gravelly voice. David Twohy is a pretty underrated writer and director with a strong visual style. Pitch Black was a surprise hit with viewers and left such an impression that a franchise has been born from it, not limited to two films but also video games and an animated film. The Chronicles of Riddick was a mis-step, but I feel it’s also underrated for at least building a new cinematic universe that shied away from generic aesthetics. But now we come full circle as Riddick attempts to capture the spirit and low-key vibe of Pitch Black. Riddick begins with the character betrayed by Necromonger Vaako, again played by Karl Urban who deserves kudos for returning to the series when he really didn’t have to. The awesome sci-fi loving actor ensures the third film continues a cohesive universe built by Twohy and Diesel. 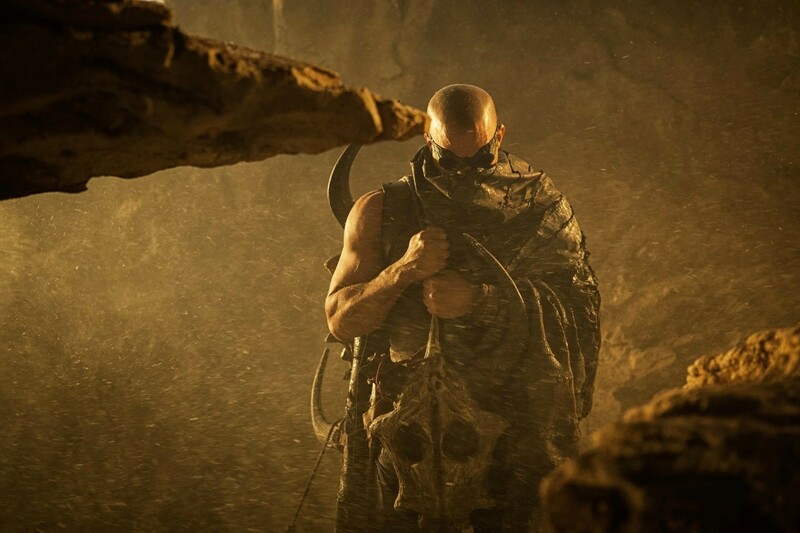 Riddick is left abandoned on a harsh planet, injured badly and fending off rabid alien-dogs and alien-snakes for the next thirty minutes in near silence. Ok, I’m totally on board by this point. I love man versus nature stories, but something was off about this. I’m usually the one defending long silent scenes of a character battling the elements to survive, what’s going on here? Then I realised what it was. CGI. In Predator, when Arnie is battling his nemesis in the jungle, the alien is a solid, tangible thing. In Enemy Mine, Dennis Quaid is at conflict with another physical presence in the form of Louis Gossett Jr in tons of prosphetics. 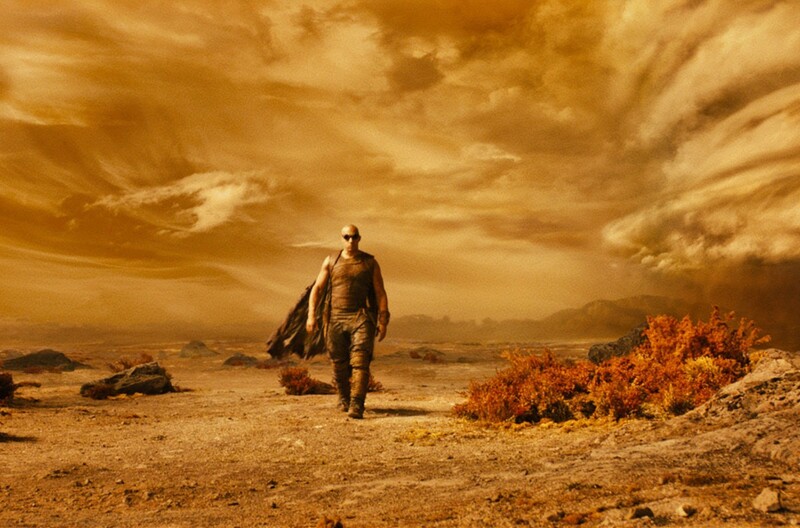 In Riddick, Diesel is just facing off against CGI. It’s enough to hinder my mind from engaging fully with his character’s plight. It’s not that I’m against CGI. In Peter Jackson’s Lord of the Rings trilogy, Gollum works because he has a personality thanks to a real actor playing the role, they just draped him in CGI. And with Chronicles of Riddick, I didnt mind the cheap looking CGI either. I admired the effort to build a new sci-fi universe that tried to be different from the norm, but the CGI is to this particular film’s detriment. Riddick fighting off CGI dogs and snakes? I just don’t care, it feels so irrelevant. Why not use a real dog and put a bit of CGI on him? At least with practical effects, the part of my brain that feels empathy would kick in, watching an actor interact with something solid. Here though, it’s a lot of preamble until Riddick meets a bunch of mercenaries coming in for the bounty on his head. The mercs land, set up a perimeter and Riddick begins to pick them off. We get infighting, the horror trope of mercs dying one by one, followed by an escalation in environmental threats, with monsters rearing their heads, forcing Riddick and the mercs to team up. The problem is that everything is largely derivative of every trope you’ve ever seen. Only a few performances and Twohy’s style keeps it fading from memory. He really knows how to make a lot out of a little, his love of sci-fi is obvious, and I especially loved the dutch camera angles sprinkled throughout the franchise. The inclusion of the ever-dependable Katee Sackhoff is another reason to remember the film. Though she may be typecast in tough sci-fi roles, she does it so well you cant complain. More Sackhoff on our screens please Hollywood, she can act and punch people at the same time, yes please. If you have a hankering for watching her snipe people with horse tranquilliser, you can get your fix with Riddick. But the film takes a very simple premise and stretches it to 118 minutes. The story could have been told in half that. As a result there’s a lot of non-essential scenes, all which feel obligatory: a young man rattling away Bible talk in fear, mercs complaining about Riddick being a ghost, a creepy shower scene, and the centrepiece of the film where the mercs debate whether Riddick has sabotaged a lockbox containing power nodes for their ship. It’s a fun sequence, but ultimately pointless. The monster threat is just a mess of CGI again, completely harmless, which is perhaps why they’re relegated to the third act and are not that pervasive. Riddick is the centrepiece here, he’s meant to be the monster in the dark to be wary of. I like that angle, but the film doesn’t seem to fulfil that promise. He’s not monstrous enough. Riddick seems too tame an anti-hero for my liking, I’d really like to see him be more ambigious and have more clarity in the kind of person he is and what rules he adheres by. So far it just seems his only rule is ‘no women, kids or animals shall be harmed’, which is not so much anti-heroic than it is old-fashioned and decent. I definitely enjoy this kind of sci-fi, an intimate tale not concerned with saving the world or galaxy, more concerned with a character’s survival and shifting alliances. But the idea was too simple and the film too long. I do hope we get more Riddick though, Vin Diesel seems a likaeble guy, he even put up a substantial amount of money to fund this film himself. I just hope Twohy writes a more substantial story next time and goes for more bite too.